Your vehicle’s engine contains dozens of sophisticated components performing complex tasks galore. All of these components are kept in sync by a single part – the timing belt. In order for propulsion to be produced by your motor, a series of small, controlled explosions take place. Fuel injectors spray gasoline and air, spark plugs ignite the mixture and pistons are resultantly shot down shafts due to the explosion. After this, valves open up in order to release fumes and then the cycle begins anew with turnover occurring at an extremely quick rate. Your timing belt performs the incredibly-important task of making sure that the valves open up at precisely the right time. If the timing is off by so much as a nanosecond, pistons will not work properly and your engine will fail. 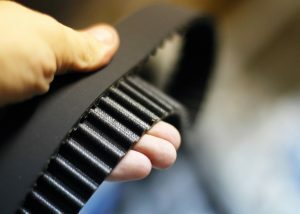 Since your timing belt performs such an important task, it’s very important to make sure it’s in good shape and is replaced in proper intervals. Your owners’ manual will typically recommend your timing belt be replaced every 100,000 miles or so but it’s not a bad idea to have it inspected before you reach that milestone. A rattling sound from the front of your engine is an indicator that your timing belt may need to be changed. If you have any questions about your timing belt or any other component in your vehicle, be sure to call us at 303-347-1010 or swing by our auto repair shop in Littleton! Our ASE-certified technicians are dedicated to keeping you safely on the road year-round. Click HERE to schedule an appointment online.